Here’s what’s up in the world of TV for Monday, November 28. All times are Eastern. 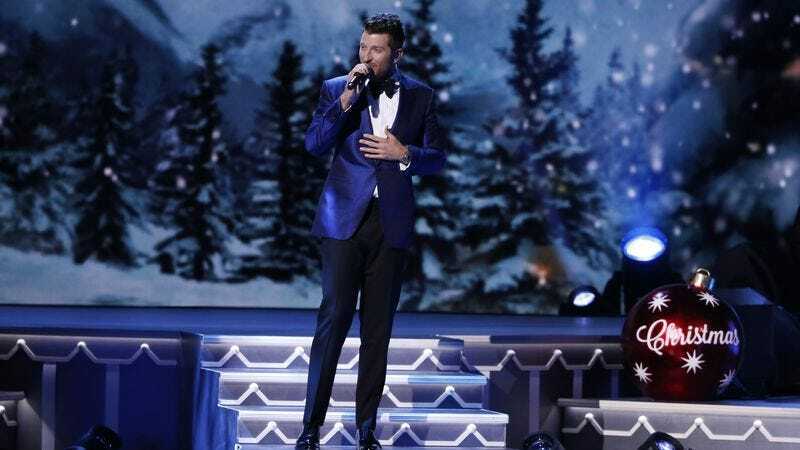 CMA Country Christmas (ABC, 8 p.m.): Oh what can we possibly say about ABC’s CMA Country Christmas? Hopefully Beyoncé doesn’t show up—that would be awkward. We can tell you a little more, we suppose. Jennifer Nettles hosts this Christmas concert special, as Jennifer Nettles presumably hosts every other country music special. And as for performances, you can look forward to Idina Menzel, Amy Grant, Brad Paisley, Kelly Clarkson, and Sarah McLachlan, to name a few. Supergirl (The CW, 8 p.m.): It’s a bird, it’s a plane… Nah, it’s simply Supergirl taking a little break—they call it a “winter finale,” you know—from the schedule. And what better way to say “see you next time, Supergirl” than with “a night of confessions?” Keep in mind that this night of confessions also kicks off the “epic superhero crossover” between Supergirl, The Flash, Arrow, and Legends Of Tomorrow. Oh, we really buried the lede here, didn’t we? Also, it’s a Thanksgiving (sorry, Christmas) episode, because “an alien invasion on [Earth One]” simply isn’t enough to have on one’s plate. Like Supergirl herself, Caroline Siede has her work cut out for her. Christmas Cookie Challenge (Food Network, 8 p.m.): Oh yes, it truly is the most wonderful time of the year: Christmas Cookie Challenge o’clock. “Five bakers put their holiday cooking-making skills to the test in this competition with a prize of $10,000 on the line.” In theory, everyone should win, because there are no losers when it comes to Christmas cookies. But since there can only be one winner, you probably won’t want to miss this. Patria O Muerte: Cuba, Fatherland Or Death / Mariela Castro’s March: Cuba’s LGBT Revolution (HBO, 8/9 p.m.): Tonight’s HBO’s documentary slate doesn’t feature any type of cookie challenges, but it does have two looks at contemporary Cuba. The first, Patria O Muerte, takes “a look at social, economic and cultural conditions in Cuba in the 21st century as they’re experienced by artists, activists, writers, musicians and other ordinary citizens who struggle in their everyday lives.” Then, the 40-minute long Mariela Castro’s March features a profile on Raul Castro’s daughter (the titular Mariela), “a member of the National Assembly who is an influential advocate for the nation’s LGBT community.” Basically, the opposite of tonight’s Christmas offerings. Fameless (TruTV, 10/10:30 p.m.): TruTV’s Fameless returns with its second season “winter premiere” and two back-to-back episodes. What’s in store for the David Spade prank show? That appears to be under wraps. But we’re guessing there’s definitely no Christmas cookie action or alien invasion action here. Rugrats, “I Remember Melville/No More Cookies” (Amazon Video/Hulu/iTunes/ Vudu/YouTube): We’ve mentioned cookies far too many times in this edition of What’s On Tonight for you to not get why we’re suggesting (one half of) this episode.